Breast Cancer is the second most common kind of cancer in women. About 1 in 8 women born today in the United States will get Breast Cancer at some point. October is Breast Cancer Awareness Month, which is an annual campaign to increase awareness of the disease. On October 12, Trinity Transportation’s East Detroit terminal hosted a cancer fundraiser to raise money for the American Cancer Society. 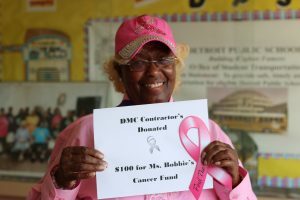 Ms. Bobbie, who is one of Trinity’s school bus drivers and a 28 year breast cancer survivor, helped organize this event. “It’s very important because there’s someone that you know in your family that has cancer or has had cancer,” Ms. Bobbie said about donating to this cause. Her fundraiser raised $150 while her team, Crusaders for Life Team, raised over $2,600. To donate to Ms. Bobbie’s team or to get involved, click here.